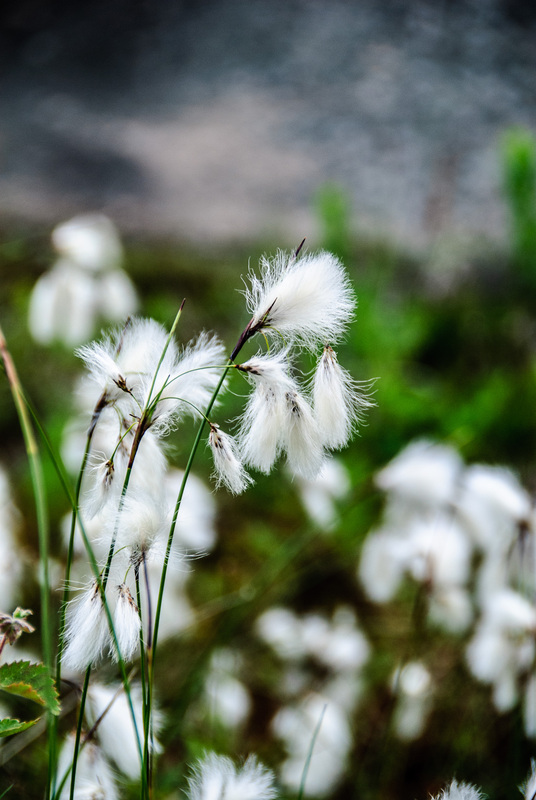 US and UK translators of Finnish literature have come together to form a new professional community, the Finnish-English Literary Translation Cooperative (FELT). FELT launched its public website (www.feltcooperative.org) today. The FELT website provides information about new and upcoming works of Finnish literature in translation, worthy works of literature not yet translated into English, translators’ professional bios and contact information, and reflections on the art of literary translation. FELT is a collegial initiative begun by professionals currently translating fiction, non-fiction, poetry, and drama from Finnish into English. Its mission is to promote Finnish literature in English translation and professionalism in Finnish-to-English literary translation. 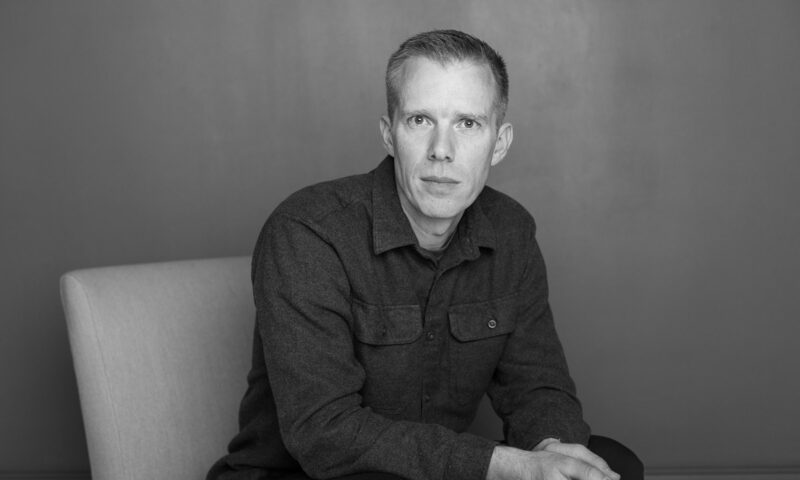 The initiative sprang out of growing international interest in Finnish literature and a desire to provide both mutual support for its members and a place for publishers, agents, translators, and others interested in literary translation to learn about works of literature from Finland. FELT is not a union or trade organization, but a community where translators can exchange news, ideas, and working methods with each other and share their work with the public. FELT translators abide by generally accepted principles of good translation as defined by the Translators Association, the American Literary Translators Association (ALTA), the Finnish Association of Translators and Interpreters (SKTL), and other relevant translation associations. FELT members work with creative fidelity to source texts and transparency in the translation process. All FELT members have published a minimum of two book-length Finnish-to-English literary translations outside of Finland and have a professional level of work and educational experience. Current FELT members are David Hackston, Emily Jeremiah, Kristian London, Lola Rogers, and Owen Witesman. As reported today in the Helsingin Sanomat, YA author and poet Vilja-Tuulia Huotarinen has been awarded this year’s Finlandia Junior prize for children’s and young adult literature for her novel Light, Light, Light [Valoa valoa valoa]. You can read more about the novel at the Stilton Agency website or my post on my English sample translation. More on the author at Books from Finland and the Finnish Literature Exchange FILI. This year’s Finlandia Junior prize for literature has been awarded to Vilja-Tuulia Huotarinen (b. 1977) for her young adult novel Light, Light, Light. Awarded by the Finnish Book Publisher’s Association for outstanding children’s and young adult literature, this year’s prize was decided upon by musician Paula Vesala. The size of the award is 30,000 euros. “Huotarinen doesn’t underestimate her reader, instead delivering a broadside,” Vesala said in her award speech. Huotarinen is a lyricist and young adult writer from Tampere. Prior to this winning novel she has published three collections of poetry as well as the Silja trilogy, also for young adults. She is a previous winner of both the Union of Finnish Writers and Kalevi Jäntti prizes. 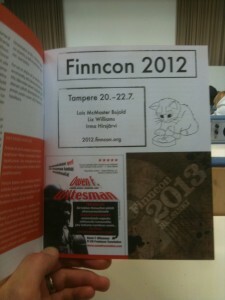 A few quick thoughts post-Finncon. First of all, speculative fiction is alive and well in Finland. Every panel I attended had good turn-out, and there was a lot of energy, despite some pretty stupid things being said by a few presenters. Prediction: if you tell people they won’t succeed and won’t make any money doing what they love, they won’t. Mika Waltari, Johanna Sinisalo, and Sofi Oksanen didn’t succeed and make money until they did, writing things that blew away not only the domestic audience, but also international readers. The comments from the keynote speakers, particularly Richard Morgan, were excellent, doing the opposite of what I described above: he not only gave concrete tips on successful writing, he was also generally encouraging of new authors. All your con program are belong to us. While at Finncon I participated in a panel on literary exports with Irma Hirsjärvi, Toni Jerrman and Cheryl Morgan, moderated by Maria Säntti. My main message was that speculative fiction is not marginal literature in the English-speaking world, especially the United States, and that there is room for foreign authors who play the game. What is the game? To get published, you write a great book that will have international appeal, prepare a query letter, synopsis, and sample translation in English, and send them to lots and lots of people you have access to through the contacts (or an agent) are constantly making because you’ve overcome your shyness for the sake of selling your book. And for goodness sakes, use qualified native translators and editors. It matters. Some reaction to the panel (in Finnish). Prior to Finncon, Burning Bridge Literary Agency hosted a translation seminar focused on speculative fiction and comics taught by yours truly and attended by Claire Saint-Germain (France), Kristian London (US), Alexandra Stang (Germany), Mattias Huss (Sweden), and Ave Leek (Estonia), all up-and-coming literary translators. The seminar was a great success–special thanks to the organizers, Maria Säntti, Terhi Hannula, and Annukka Vähäsöyrinki, as well as our special guests, cartoonist Joonas Lehtimäki and sci-fi author M.G. Soikkeli. Also Petteri Oja of Zum Teufel Press and the Turku Sarjakuvakauppa (“comic shop”) for letting us invade his shop on short notice. 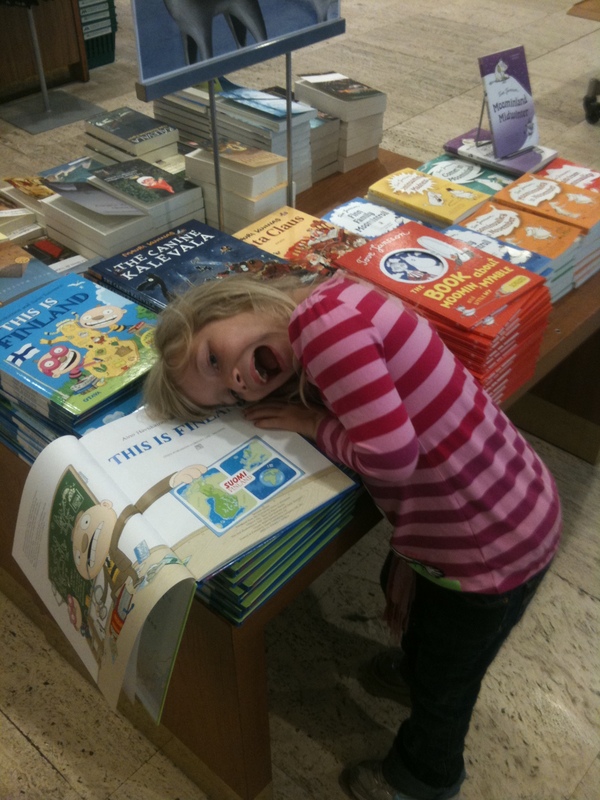 Big in Finland--Julia hamming it up with the one translation I wish I would have asked for royalties on. This year I’ll be running a seminar for translators interested in speculative fiction and comic translation in conjunction with Finncon, organized and funded by the Turku Burning Bridge Literary Agency project and FILI. On Saturday as part of the Finncon program, there will be a special panel discussion on Finnish speculative fiction abroad featuring myself, Irma Hirsjärvi, Maria Säntti, Toni Jerrman, and Cheryl Morgan. The time of the panel is a little uncertain. Check announcements at the con. If you’re attending Finncon this year, drop me a line so we can meet up!